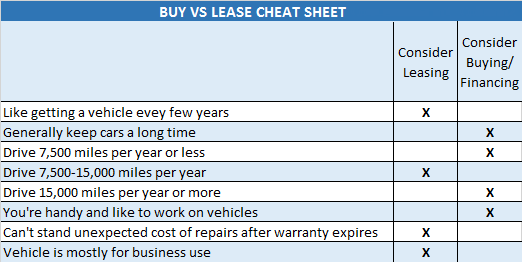 The answer to this question really depends on what the effective rate is (lease versus purchase), how long you typically keep your car and total miles you drive annually. If you like to get a new car every three years or so, you should consider a lease. If you prefer to keep your car a long time, then you probably should buy it. If you put over 15,000 miles per year on your car, avoid a lease as there can be penalties for mileage beyond that. On the flip side, if you drive very low miles (e.g. less than 7,500 miles per year) you most likely would be better off buying, as your vehicle would be worth more than the vehicle “residual value” at lease-end. One of the most important tips is to have a figure in mind of what you want and what you want to pay before you go to the dealership. The automotive industry is so goofy with pricing - MSRP may be 5%+ more than what others are actually paying - so do your homework using Emdunds.com or some other car site where you can actually “build” the car to your liking and get the “true” price of that vehicle. Furthermore, there are still “bad guys” in that industry that cannot be trusted, so paying attention to detail is important or they’ll take more than their fair share from you. Don’t let them pull the, “How much can you afford?” trick. It’s no myth that dealerships are pushing to get vehicles off their lot before month-end to make quota. That said, put your purchase or lease off until the end of the month. Furthermore, the winter months can be an excellent time to get into a new vehicle as the lease and purchase incentives on the previous year’s models can be very attractive. Certified, pre-driven vehicles usually are more bang for the buck. It is true that the minute you drive a new car off the lot, it depreciates significantly. With a certified, pre-driven vehicle, you aren’t paying the “new car premium” but you are still getting a low mileage car which carries a nice warranty. Is the vehicle for business or personal use? For business use, a lease may be something to consider as the lease payments may be fully deductible. Purchasing the car won’t benefit you as much in this case as income tax rules typically provide only a small amount of annual depreciation for purchased vehicles. Go online and compare the pending lease or purchase. There are lots of sites out there to compare and analyze. I like Lease Guide.